With Thanksgiving being a week "late" this year, there's a bit less time to get your Christmas shopping done. We know of plenty of people who aren't finished shopping yet. Are you one of them? Today we have personalized and fun gifts that kids will love, and they are guaranteed to arrive by Christmas with GROUND shipping. With More Than Paper's great prices on these items and ground shipping, you are sure to save money too! Personalized children's books are a fun way to encourage children to read. Kids love to see their name in print and More Than Paper has a huge selection from Batman to Sesame Street to Ballerina Princesses. There's something for every interest. MOGO magnetic charm bracelets continue to be hot this year and we have a variety of styles from cheerleading to sports to "BFFs," choose which set interests your daughter. We also love our selection of brand new monogrammed rain boots by Zoubaby. We have a variety of colors from which to choose and kids will love stopping around in the rain in style. They are just $45.00 each which is $20.00 OFF suggested retail! Speaking of style, we also love our large selection of monogrammed hair bows by E. Olsen Designs. These look adorable in little girls hair and are perfect stocking stuffers! While you still have some time to order, you do need to order by December 17th for these items. 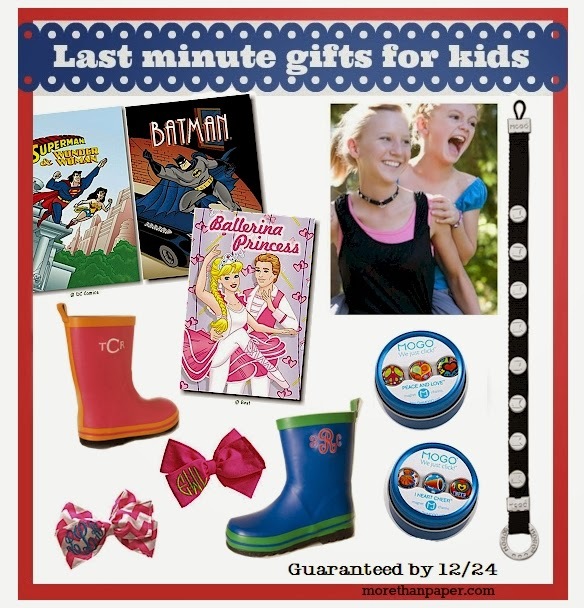 If you need more ideas for kids or adults, check out more Last Minute Gift Ideas or feel free to call us for one-on-one help in choosing the perfect gift!